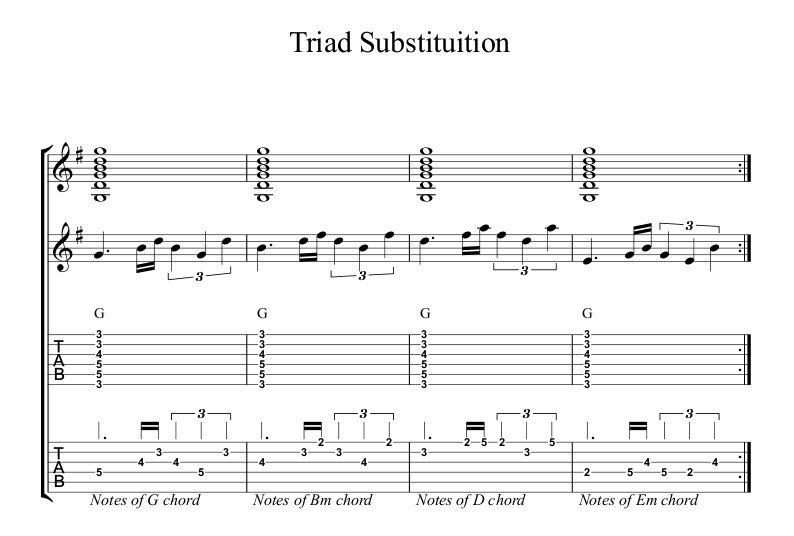 This is a guitar lesson about how to substitute triads when soloing. If you feel that this is all over your head but want to find out more, please visit these links before you attempt the lesson. A fresh read through of the conspiracy and a few clicks in chordacus. In today’s lesson, we are going to be in the key of G, we are going to use the E shaped G major scale. That’s the first root note on the 6th string, fret 3. Inside this major scale, we find 4 very important tools that we can use when we improvise. In order to play freely, you must be able to see all these, inside this E shaped G major scale. To learn this you practise all the different shapes separately, then put them into master exercises, culminating with all arpeggios, all chords and all modes inside the E shape. When you play these permutations they are not like a chromatic exercise, they are musical. If you combine the exercises with playing songs you’ll start to hear what a IV chord sounds like. If you want to make that IV chord to sound really Lydian, you play the #4 interval over it. Check now, can you see where the #4 is? It’s on the D string, fret 4, the note is a F#, a #4 away from C, chord IV in the key of G major. So if you want to sound modal, you hit those notes, you hit the ones you added on top of the chord and pentatonic notes. 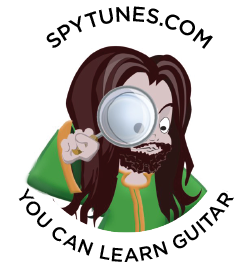 This is what I spoke about in my last blog on playing modally and what Guthrie speaks about in the Guthrie Govan scales blog. If you instead want to sound more simple in your melodic adventures, and this is the lesson of the day, you stay away from the more exotic notes like #4 and instead focus on the simplest component, the triad, and take it from there. Let’s pick four chords for a little experiment and see what we can do with them, the same concept will work for all seven chords and all five shapes on the neck. 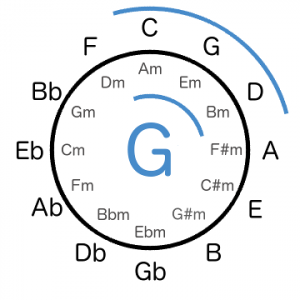 The G chord has the notes G – B – D, the Bm has B – D – F#. Should we extend the G chord along the major scale the next note would have been a F#, a Gmaj7 would have been the full chord. So, over a G chord, we can play either G B D or go up to the Bm chord and play B D F#, in doing so we create a more sophisticated sound, a maj7 sound. If you practice all exercises as described above, all this information will be available to your fingers. You just see a little part of a shape and target appropriate intervals as you solo. Remember, all chords can naturally build like this, the Am, for example, skip a chord and find C, play this triads notes and you get a min7 sound over the Am chord. Back to the G chord, skip a chord and you had Bm, this gave us Gmaj7. Skip another one and play a D triad, the notes are now the upper part of a Gmaj9 chord and we are halfway into the modal world again. Should you have gone the other way, so from G, skip a chord down the major scale and you would have ended up on Em and a 6th interval is highlighted. A lot of guitar players actually do go through with their scale practice but then hit the next hurdle of how to play using the scale, without sounding like they are just playing a scale. In order to solve this, you need to start building little melodies or ‘licks’. This is best done with intervals in mind so you can translate to other shapes and use the knowledge in other songs and situations. To hear what a triad sounds like and how it extends through the scale, let’s create some licks only using three notes. We’ll keep the rhythm but move up to the next chord, play it using these three notes, then move up again, play it using these notes. Below is an example of this in TAB, sheet music and an audio file. This is all stuff you should be doing when you improvise. The aim is not to memorize licks but to learn how to come up with them on the fly, as you improvise. Remember, the further away you go from the triad chord, the more adventurous you’ll sound.